We retrieved an article from Tucson Lifestyle Home & Garden. Customer’s browsing the web can locate the article in the November 2011 issue of the magazine. The article combines professional tips from our owner, Richard Geare, alongside high-quality photos of our products. SEE THE MAGAZINE ARTICLE BY CLICKING ON THE LINK BELOW!!! Click on the following link to read the article in a new tab: Tucson Lifestyle Home & Garden. Take a look at our new selection of 2018 fountains. Some of our favorite vendors have recently updated their catalogs. If you have any questions regarding our inventory or installation please give us a call or stop by today! 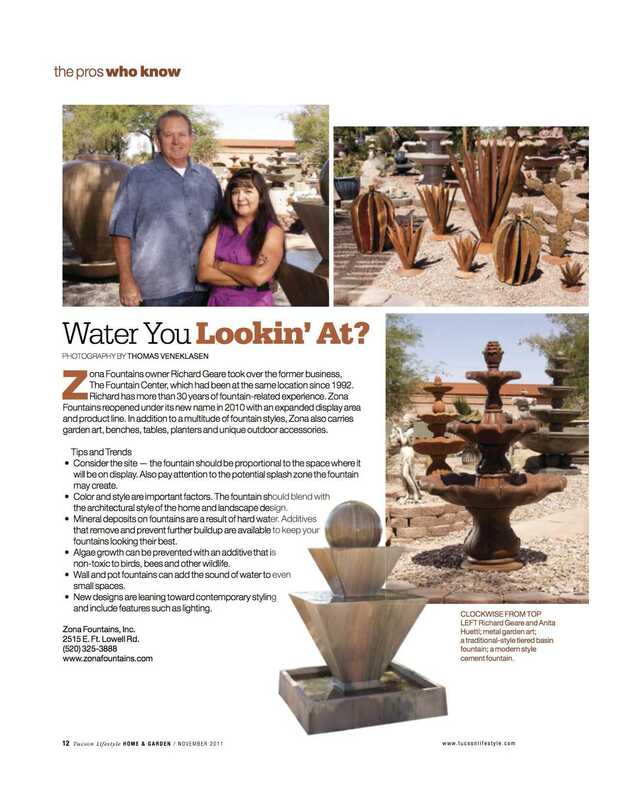 This entry was posted in Zona Fountains Archives and tagged 2011 Archive, Alex Hinrichsen, ARHINRICHSEN, Arizona, fountains, magazine article, Richard Geare, Southern Arizona, Tucson, Tucson Home and Garden Magazine. Bookmark the permalink.